Oh Ravnica, Tis Such Delight! A Land of Milk and Honey! Azorius Arrester, and Lotleth Troll, all perfectly good, and Corpsejack Menace and Lyev Skyknight also give you aggressive threats with nice effects stapled on. I actually played a deck with a bunch of detain and flicker effects, and Archaeomancer and Ghostway, which I may have bored you with already. There’s also a tempting aura in the form of Righteous Authority, which sits real nice on some hexproof creatures, if you want to play with those but not just make bogles. Geist of Saint Traft or Ojutai, maybe? Oh, and Vraska the Unseen is a weird planeswalker in that you’re kind of getting – usually – a pair of Vindicates on lay-away. Her +1 isn’t such a big deal, but it does say that anything sent to get rid of her is being traded for, and that’s kind of all you’d expect. Like, seriously, think about it, 5 mana for Vindicate twice is pretty cool. Still, let’s talk about this great big dumb idiot. Deadbridge Goliath was a contentious card when it was revealed and it still is. I have played with this card a lot and its scavenge ability is only ever meaningful in pressure situations. But a 5/5 for 4 will block a lot of things, and then you’re not far away from the scavenge value to make your next thing big and tough. I’ve played with the Goliath a bit – its creature type persistently annoys me, and its lack of flexibility is also irritating – but I think the thing I really want to do is get a physical copy and stick it in my Cube. 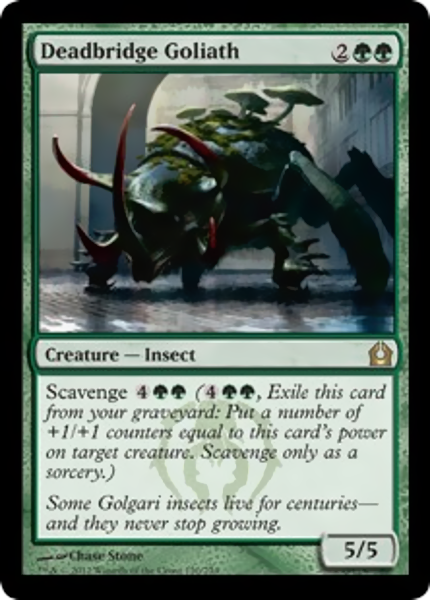 It’d work with the +1/+1 themes of the green white deck and the dying creatures theme of the green black deck, and it’s also just a giant lumbering idiot! I like this bug, even though it hasn’t served me well. While Return To Ravnica started off some of these boringly competent cycles (hi keyrunes, hi charms) it didn’t seize me on a mechanical level the way that Gatecrash did, which is why I’m a little surprised at how few of the cards there are in Gatecrash that I like to talk about. As mechanics go, I like Evolve, Bloodrush, Cipher, Exploit and Batallion, but not one of those cards really feels like it has a single stand-out representative that’s worth putting everywhere. What’s more, because this set was sensibly designed, none of those mechanics really got some gonzo mistake card, and instead we have to make do with merely fine cards, all priced carefully enough to not be disruptive to other formats. There’s an evolve deck and it’s kind of fun when it gets going, but it is an evolve deck, and there aren’t many evolve cards that can be thrown into other decks very well. Hypothetically there are Evolve creatures that (spoiler alert) work out just fine if they only evolve once, but others like Cloudfin Raptor kind of really need that extra oomph to be worth playing with. 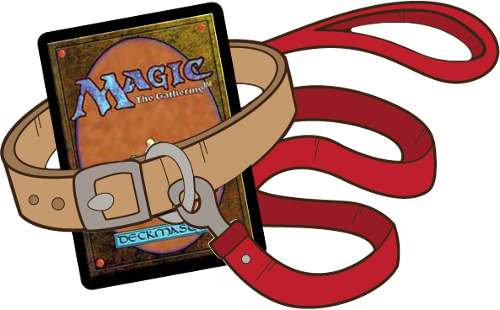 Still, there are some gems for those of us who like to build decks, with the aforementioned charms all being varieties of good. There’s a sturdy control (and pauper legal) finisher in Dinrova Horror, the surprisingly robust combo engine Illusionist’s Bracers , control toys in Mystic Genesis, Deathpact Angel and One Thousand Lashes, Aristocratic creatures like Ogre Slumlord, and Rubblehulk makes a noble showing as a Bloodrush card you can run alone without it being meh. Crowned Ceratok is pretty decent, and fits along some later Tarkir cards, too. If we were talking about just me, the real standout for this set would be Sunhome Guildmage, who is like the Rakdos Guildmage, but and you’d imagine might do all the same work, except for an experience I had a few nights ago. 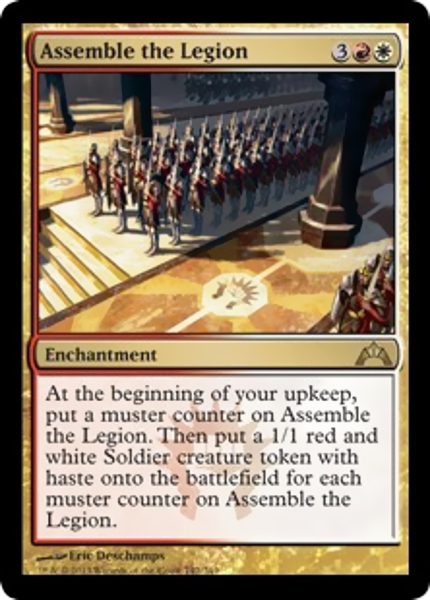 I put Assemble the Legion in my multiplayer cube as a reward for drafting the red-white token deck. It was a first pick for one player, and when it hit the table, the whole game became about it. I loved it. It made him so happy to tick it up, and it was interesting seeing the way that other players responded to the growing threat. Eventually a well-timed Primal Command got rid of it, but while it was around it was glorious to behold. This set looks a bit stuffed when you have the cluestones and whatnot, but I really like some of the build-around cards like Nivix Cyclops, Renegade Krasis, Rot Farm Skeleton, Species Gorger and Zhur-Taa Ancient – and wow, there’s a pattern. The krasis is a favourite for its interaction and curve with Cytoplast Root-Kin – you play the Krasis (ideally on turn 2, with some variety of help), then the Rootkin and stack their abilities so that the Krasis evolves, puts a +1/+1 counter on the Root-kin, then the root-kin puts a counter on the Krasis. The Rootkin can then leech counters off the Krasis to keep it in evolving size, if that’s what you really need after you have a 5/4 and 6/6 on turn 3. 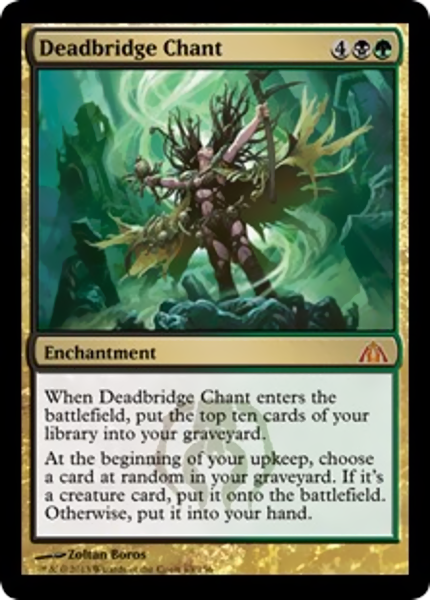 Instead, let’s talk about Deadbridge Chant! Graveyard fillers tend to be very A Or B – they’ll put something particular in your graveyard, like Buried Alive, or they’ll get something out, like Zombify. The Chant is one of those utilities I like better, because it both fills your yard and recurs what you put into it. Chant doesn’t let you build a combo, because it has that hated word random, but it will give you something, like a land or a creature, or even just another chant. It’s a really good card to have around, but it pushes your deck towards things you can cast, that are nonetheless valuable when you don’t have to pay for them.